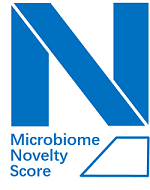 Microbiome Novelty Score (MNS) is proposed to evaluate the compositional uniqueness of a microbiome sample when compared to all microbiomes in the database. A higher MNS means lower similarity to those microbiomes that have previously been sampled, suggesting higher novelty. If a microbiome has MNS ≥ 0.12 (mean MNS of 2010) then it is considered as "Novel" sample. MNS starts from 2010, and is not applicable for samples produced/published before 2010. Click here to check all Novel samples. 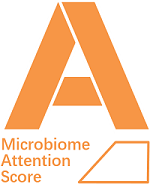 Microbiome Attention Score (MAS) is proposed to measures the connectivity of a given sample to all subsequent samples in the database. A higher MAS means more samples with similarity or samples with higher similarity had been sequenced, suggesting higher attention from the scientific community for this input sample. If a microbiome has MAS ≥ 10 (top 20%) then it is considered as "High-attention" sample. MAS starts from 2010, and is not applicable for samples produced/published before 2010. Click here to check all High-attention samples. Copyright © 2018. All rights reserved Single-Cell Center, QIBEBT, CAS.